Macy Gray: My new album is "wild"
Singer Macy Gray detailsher highly-anticipated new album, slated for release in Summer 2017. Macy Gray on Trump: "If he fails, we all fail"
Larry King: She’s releasing a new album, not titled yet. Are you done? Have you finished the album? Macy Gray: It’s almost there. Maybe 80, 82 percent. Larry King: You write your own material? 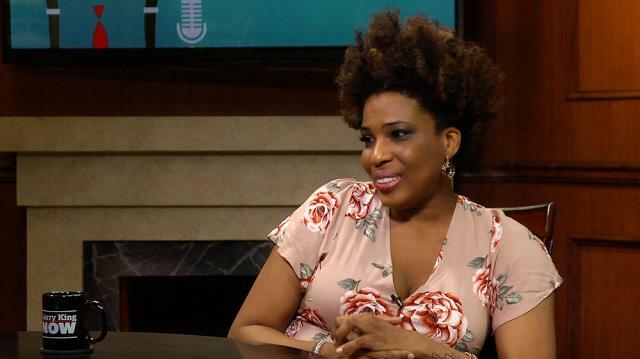 Macy Gray: Not by myself, but all the songs on the album, I’m writing them. Larry King: You know when it’ll be released? Larry King: ‘White Man’ is in it, right? Larry King: Will it be very new and different? Will people be surprisd? Macy Gray: Yeah, it’s definitely Macy Gray, but it’s wild, you haven’t heard what we’re doing yet, it’s very fresh. Larry King: Woah, you’re making this tempting. Larry King: You collaborated with Ariana Grande, right, on her new album? Larry King: Do you like collaborating? Macy Gray: I do, I do. It’s like artist-to-artist. Larry King: Is she in your new album? Larry King: There’s no collaboration in the album, right? Macy Gray: Cause you know, all that stuff. Larry King: Why is all of this so secret? Larry King: Are you scheduled to tour when the album comes out? Macy Gray: Yes, we’re lining up the touring stuff now, it’s coming together, takes a minute.